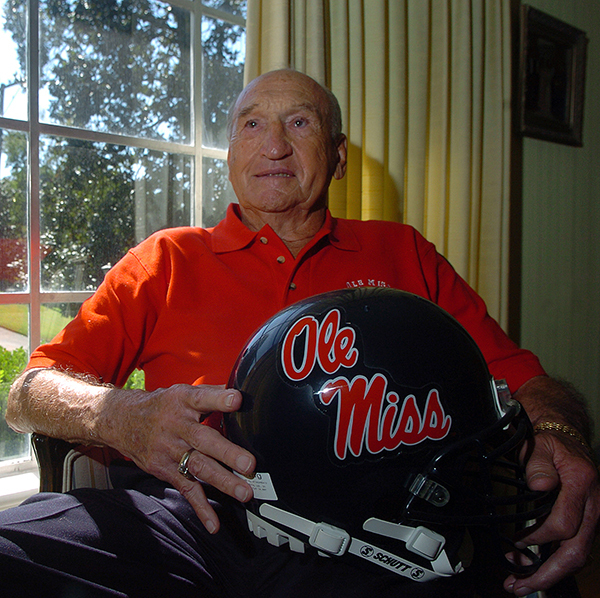 According to The Vicksburg Post, John Albert “Kayo” Dottley Sr., a longtime Vicksburg resident and one of the greatest football players in Ole Miss history, died on Saturday at the age of 90. Dottley is a member of seven different sports halls of fame, including both the Mississippi and Arkansas state halls and the Ole Miss Hall of Fame. Dottley was born in Birmingham, Alabama, raised in McGehee, Arkansas, and had lived in Vicksburg for more than 65 years. On his way to the River City, Dottley became an Ole Miss legend. He was a two-time All-Southeastern Conference running back and led the nation in rushing with 1,312 yards in 1949. It stood as an SEC single-season record until 1971, and still stands as the Ole Miss record. His 14 rushing touchdowns that season also are tied for the school’s single-season record. Dottley is the only player in Ole Miss history with more than one 200-yard rushing game — he had three, all in the 1949 season — and still ranks third on the school’s career rushing yardage list with 2,654. Dottley had two 1,000-yard seasons in 1949 and 1950. Until Deuce McAllister did it in 1998, he was the only Ole Miss player to ever do it even once. Five players have done it since McAllister. Dottley was as tough a player as he was fast. He broke his left arm twice and his right arm once in high school but never missed a game. He broke his foot playing baseball the week before playing Tennessee in 1946, but gutted it out and still ran for 100 yards against one of the best defenses of the day. In a 2009 interview with The Vicksburg Post. Dottley joked that a fear of legendary coach John Vaught inspired him to play more than any desire. In addition to his football exploits, Dottley was a member of Kappa Sigma Fraternity, the Ole Miss Hall of Fame, and Omicron Delta Kappa. He was Freshman King and elected Colonel Rebel. 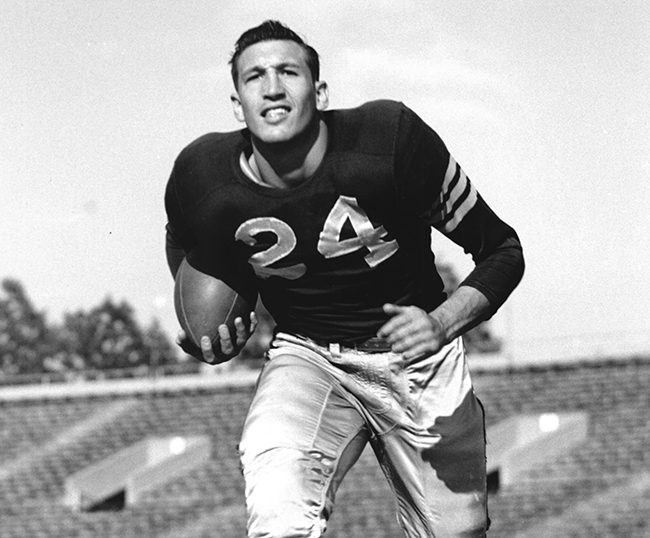 After his stellar college football career, Dottley was selected in the second round of the 1951 NFL draft by the Chicago Bears. Dottley ran for 670 yards in his first season, earning the rookie of the year award and a Pro Bowl bid. Dottley retired and moved to Vicksburg with his wife Nina Mae Nosser, a Vicksburg native. The two had met at Ole Miss when she was a cheerleader and he the football star. The couple was married for 64 years. They have three children, nine grandchildren and four great grandchildren. Dottley earned his masters degree from Ole Miss in only four years, and upon moving to Vicksburg he became owner of a Jitney Jungle supermarket. He also worked with his father to found Dottley’s Spice. Dottley coached youth football and the Bowmar Bears for many years, making a lasting impact on many young men in Vicksburg. He was also an avid golfer who won the Vicksburg Country Club championship several times. Funeral services for Dottley will be held on Tuesday, November 20, at 2 pm at First Baptist Church with Dr. Matt Buckles officiating. Burial will follow in Cedar Hill Cemetery. Visitation will be Monday, November 19, from 4:30 to 7:30 pm at Glenwood Funeral Home. Memorials may be made to Blair E. Batson, University of Mississippi Medical Center, c/o Public Affairs, 2500 North State St., Jackson, Mississippi 39216 or First Baptist Church of Vicksburg, 1607 Cherry St., Vicksburg, Mississippi 39180.